Maryland RBI, a 16-and-under select-travel club baseball team, is heading to the Amateur Athletic Union (AAU) Underclassmen Super Showcase National Championship. The tournament will be held June 16-22 in Orlando, Fla., at the ESPN Sports Complex at Disney World and Major League Baseball's Atlanta Braves spring training site. Selected games will be televised on ESPN3. "This team is psyched about going to Nationals," said Michael Graham, manager of the team of players from Calvert and Anne Arundel counties, including Northern, Huntingtown, Archbishop Spalding, South River, Broadneck, Southern, and Annapolis high schools. 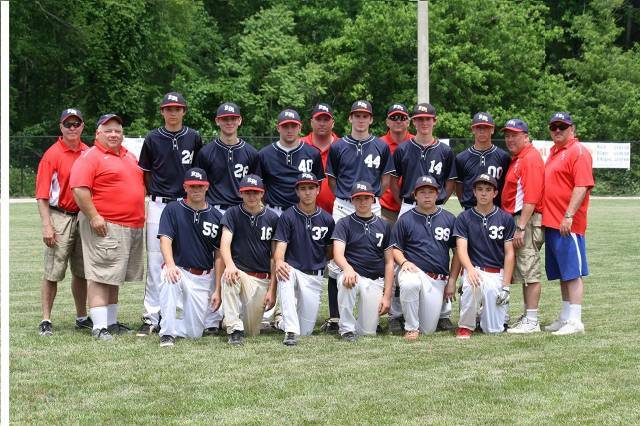 RBI, representing the Mid-Atlantic states region in the tournament, plays 80-100 wood bat and tournament games per year and so far is 29-7 overall in the 2012-2013 season. "This is our first national invitation and bid so this is really important to these players. They have put in a lot of hard work and clearly it's recognized and they are being rewarded for their efforts -- AAU is funding their lodging at a 5-star vacation resort." The team's coaches are former pro and collegiate baseball players dedicated to producing players for high school and college. "It is very gratifying to see the pieces of the puzzle come together for such a quality group of young men. Their year round dedication and passion are remarkable." Pictured left to right: (front row) Josh Matthews, Kenny Arnold, Jake Hoyer, CJ Cummings, Billy Albaugh, Dominic Stanbery; (second row) Assistant Coach Jim Hoyer, Assistant Manager Ray Albaugh, Jason Spalding, Anthony DeCesaris, Mac McGrath, Jared Smith, Zach Gamblin, Connor Graham, Associate Head Coach Chris Cummings, Manager Mike Graham; (back row) Assistant Coach Jerry Gamblin, Head Coach Ken Arnold. Not pictured: Brandyn Vogtsberger, Brandon Snow.